Carolina Sosa exemplifies the true meaning of someone who takes full advantage of the opportunities available to her. As a self proclaimed opportunist, Carolina has made it her mission to give back to her community and be a leader among her peers, something she gets from her parents. Both of her parents left their families and hometowns in Ecuador and Colombia to come to the land of opportunity. As an incoming freshman at Georgetown University, Carolina has come a long way through adversity. She’s struggled with her identity as a Latina, faced hardships with her family’s health, and steered clear of negative influences that her friends have succumbed to. No matter the obstacle, she always persists, and has most notably shown this quality through her engagements as a long-time Girl Scout, an active member of the Fairfax County Student Human Rights Commission, Vice President of the Unified Prevention Coalition Youth Council, and as the founder and director of Scholar Society, an after-school program created to foster academic interest and community involvement in low-income and first-generation students. She has been recognized for her leadership and received the 2015 National PTA Youth Advocate Award, 2015 Fairfax County Youth Volunteer Award, and the 2014 Centreville Day Citizen of the Year Award. In the future, Carolina hopes to pursue a career in public service, politics or diplomacy and continue making a difference in her community. CHCI congratulates Carolina on receiving multiple scholarships and awards and for her acceptance into the Georgetown University. 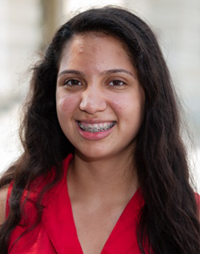 CHCI is proud to have Carolina Sosa as part of the CHCI familia! To support dynamic students like Carolina Sosa and CHCI’s programs such as R2L NextGen, please visit: www.chci.org/donate.